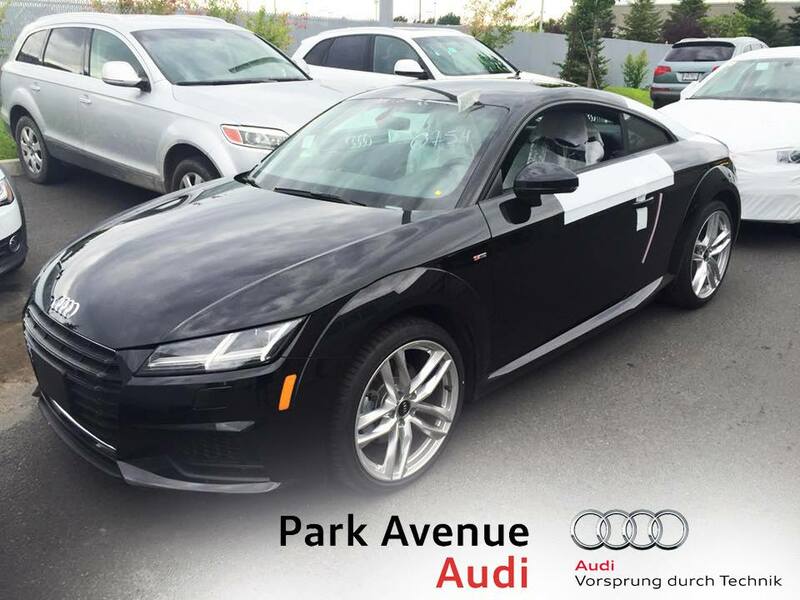 The all-new 2016 Audi TT has finally arrived at Park Avenue Audi, just in time to enjoy the last hot summer days and upcoming gorgeous Canadian fall colours. Indeed, nearly sixteen years after the model’s debut, Audi designers and engineers have finally released the 2016 Audi TT, the third and most spirited TT ever created. Unveiled at the 2014 Geneva Auto Show, the all-new 2016 Audi TT shares its platform and engine with several siblings. Based on the popular MQB platform and powered by an even more popular 2.0-liter, 4-cylinder TFSI engine, the new TT is capable of sprinting from standstill to 100 km/h in a mere 5.6 seconds while offering a truly enticing driving experience. If the output was increased to 220 horsepower, the TT still boasts 288 lb-ft of torque, which is plenty enough to deliver a ferocious acceleration and vigorous passing maneuvers. Compared to the previous generation, the 2016 Audi TT is 50kg lighter. Combine this with the prestigious Audi quattro AWD system, which comes standard on all models, and you get an impressively agile vehicle that can tackle any racetrack with disconcerting ease and confidence. Also coming standard is the sensational 6-speed S tronic dual-clutch transmission. The all-new 2016 Audi TT shares several similarities with its predecessors in terms of design while showing great progression. Indeed, while the dimensions have mostly been untouched, the original round shapes have slowly been abandoned in favor of bolder, more striking lines, giving the TT a much more athletic, more ferocious and assuredly more inspiring look. Biggest changes can be seen when viewed from the front as the new 2016 Audi TT boasts a 6-point grille with chrome contour flanked by tapered LED headlights and topped by the Audi rings logo, this time fixed on the hood. Naturally, the cabin has also been greatly enhanced and now boasts a trendsetter design that inspires passion and speed. Notably, the cockpit of the new TT redefines the look and feel of a cluster instrument by transforming the traditional analog gauges into a completely digital experience. Also, all functions can be controlled through the sport steering wheel for a safer, more enjoyable experience. So, what’s your take on the new 2016 Audi TT? Feel free to leave your comments here or visit your Park Avenue Audi dealership for a test drive!